Gr 2–5—This engaging book shows the diversity in color, size, and shape of animals' eggs, and explains the laying behaviors of a large number of creatures. Three to four sharply reproduced images from photo archives appear on each spread, and they are clear and informative. The authors' conversational style includes some humorous headers and smoothly written basic bits of information that set each creature apart: reptiles, amphibians, fish, birds, mammals, celaphopods, spiders, and insects. The organizational scheme serves browsers well as a means to whet interest; the eggs are grouped by shapes, sizes, colors, guarders, stealers, shelters, and more. The last section, "Whose Egg Is This?" poses the question above five photographs to see whether readers can identify which animal laid it. The combination of basic information and high-quality photography will enable children to answer correctly. And you thought you knew something about eggs! The many unusual examples in this book, coupled with the dazzling photography, make this an excellent choice for the classroom library. The sheer beauty of the pictures is sure to arouse interest in students and adults, and the rich volume of information will maintain it. The authors are teachers and parents who love the wild variety of the animal kingdom. Their fascination shows on every page, with short informative segments attached to each image. And those images are extraordinary! From caterpillars to chickens, and from lynx spiders to lizards, the tremendous range of animals that rely on egg-based reproduction is explored in engaging detail. The book sections are organized by the characteristics of various eggs and the actions of the animals rather than by the usual taxonomic system. Thus, the table of contents lists egg shapes and sizes, egg colors, egg guarders, egg stealers, and so forth. And surprisingly, we find that some egg stealers are snakes, some are birds, and some are fish—there are many examples that may be totally unfamiliar even to interested and relatively informed adults. Kids who are interested in animals will find much to marvel at in this book, and the layout makes it easy for them to dip into it and read a bit when they have a chance; they're sure to learn something new and interesting each time. In one spread, you can find such disparate “egg guarders” as black widow spiders, shield bugs, and alligators—all carefully protecting their precious eggs. The egg colors section starts with basic white (python) and moves on through pearl (stink bug), bright blue (shieldbacked pine seed bug), bright yellow (brown butterfly), and bright red (seagrape sawfly). The sheer beauty of the pictures is sure to arouse interest in students and adults, and the rich volume of information will maintain it. If your 6 to 10 year olds enjoy glimpses into the world of nature’s mysteries, they’ll love Animal Eggs and the introduction to egg laying and protecting behaviors. Siamese Fighting Fish blow air bubbles around the eggs that they spread across the surface of water. This protective bubble wrap helps keep them safe. Birds, turtles, alligators, and Siamese Fighting Fish are only some of the animals that lay eggs. 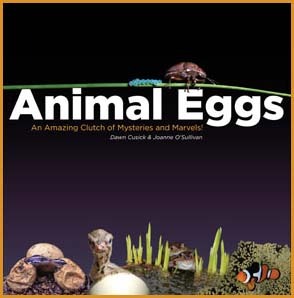 While Animal Eggs: An Amazing Clutch of Mysteries and Marvels is intended for an elementary school-aged audience, the parents and teachers also reading this will be surprised by some egg-protective behavior and adaptations. Biology teacher Dawn Cusick and children's book author Joanne O'Sullivan successfully combined skills to create this wonderfully illustrated resource on eggs. They introduce "egg layers" through brief but informative text and photographs that kids will remember. "Hello, Brother! These five-lined skinks broke through their shells just seconds before this photo was taken." The photo? The two skinks remain covered by the collapsing soft shells but they're nose to nose and the photo is adorable. One of the takeaways is that they have special egg teeth that make it possible for them to cut their way out of the shell. As a child I always wondered how some animals broke out of the shell - especially if they were beakless. They build understanding from the start. The chapters in this square 48-page book cover shapes and sizes, colors, guarders, stealers, shelters, escapers and a few that are considered either gross or cool. They conclude with a visual challenge - Whose Egg is This? The Gross? I always find the eggs laid by parasitic wasps as both gross and fascinating. One gross/cool photograph of a caterpillar covered with "hungry hitchhikers" that will feed on the caterpillar's flesh once they begin to hatch will earn a variety of responses. Great Shelter. The mermaid's purse is actually a special egg case that holds the eggs of some sharks and skates. These often wash up on beaches. The photograph shows the developing embryo of a dogfish shark inside the translucent egg case. Puking eggshells. Sometimes a snake feeds on another animal's egg. The protein provides high-energy treats. "A snake has sharp points on the inside of its backbone that crack an egg's shell as it moves through the snake's body." The shell is indigestible for the snake and it then spits the nearly entire shell out. Protective moms. A variety of strategies are developed by moms - some include toting the eggs with them while some fiercely protect. Penguins lay one egg and protect it using their bodies for both shelter and warmth. An alligator mom falls into the fierce category - don't mess with her nest. Some males qualify as dads of the year. Photographs are excellent and high quality. They've been carefully selected from a variety of national sources that includes institutes, museums, government organizations and universities. They've been carefully selected for age-appropriateness and that all intriguing gee-whiz factor. The authors explore embryology, egg-laying animal behavior and morphology of both the animals and their eggs. As an instructor fascinated by animal behavior, and as a museum educator, I find this book absolutely mesmerizing. This opens up the doors, once again, into the world of up close and personal. The humor of these authors quickly becomes apparent and that contributes to the child appeal. If your children enjoy glimpses into the world of nature's mysteries, they'll love this easy to read book. If you're responsible for teaching animal behavior and animal diversity in school, this will be a perfect resource to motivate reluctant learners. My compliments to the authors for Animal Eggs.